Yay, another Urbanspoon dinner date! Santiago Tapas is a little restaurant and bar located near Albert Park, specialising in Spanish tapas and drinks, as well as paella on Wednesday and Saturday nights. With its dim lighting and vintage and traditional decor, Santiago Tapas brings the romance of Spain to Melbourne, creating a social setting. They also provide great customer service; an eagerness to help with the menu and ensuring that the customers are catered for. One of the workers can be in-your-face at times, but I guess that’s how she expresses her friendliness and hospitality. A.T and I seem to have the worst luck with where we get seated because we ended up with the table closest to the door where the wind blows in and out. It was also closely situated next to another table of three, and therefore a bit difficult to move in and out. Just a little side note that I edited the brightness of some of the photos because they were too dark to see, and a reminder that the prices were 50% off. MONTADITO del DIA ($3.50 for two) – crusty house-baked toasts with daily Chef’s choice toppings. (Sorry I forgot what the meat was… chorizo maybe? but I remember it had Romesco sauce). I really enjoyed this dish; the bread was chewy and had a subtle sour taste to it, and the Romesco sauce went really well with the bread. 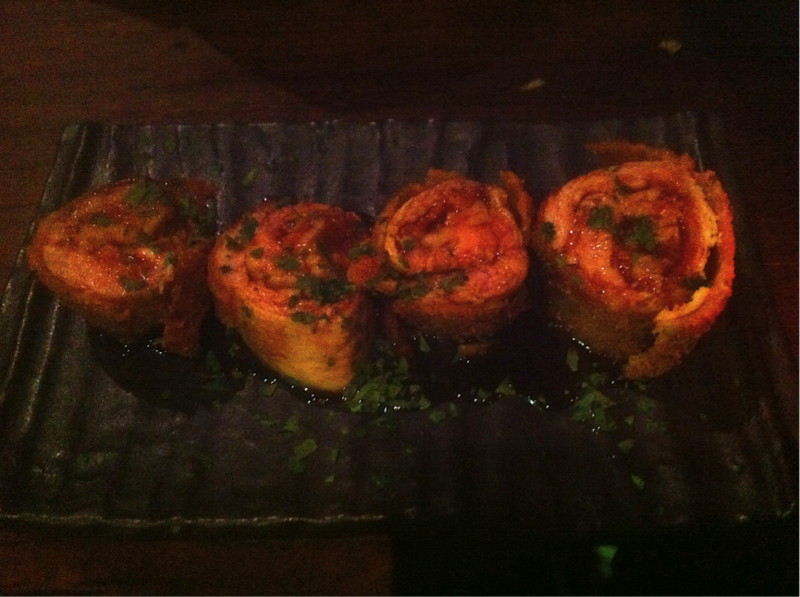 The meat was a bit tough but forgivable because the overall dish had great flavours. CROQUETAS CASERAS del DIA con SALSA de ROMESCO ($4.50 for three) – chicken leg and dill croquette whipped into a creamy filling, crumbed and fried until golden, served with Romesco sauce (the filling changes daily). 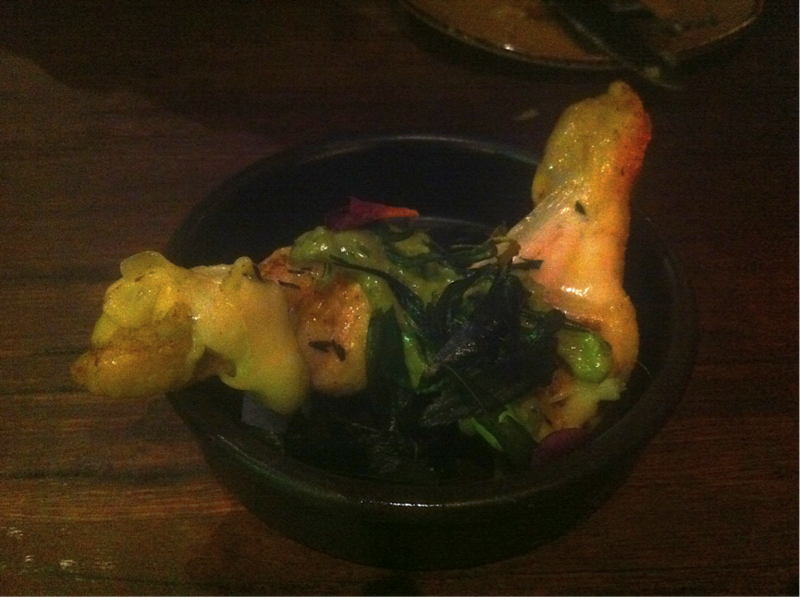 This dish was tasty and crunchy. However it needed more sauce and the filling had a bit too much flour in it and you ended up tasting more of the batter than the chicken and dill filling. FLAMENQUINES CORDOBES ($6 for four) – A traditional dish from Cordoba; pork loin rolled around house-made chorizo and manchego cheese, served with an orange and mint sauce. A.T found the sauce overpowering but I quite liked it. My first piece was very nice and tender, the outside (either skin or batter, we couldn’t tell…) was crispy and incorporating the sauce with the pork gave it a piquant, sweet flavour. However my second piece was very chewy compared to my first… dat inconsistency. 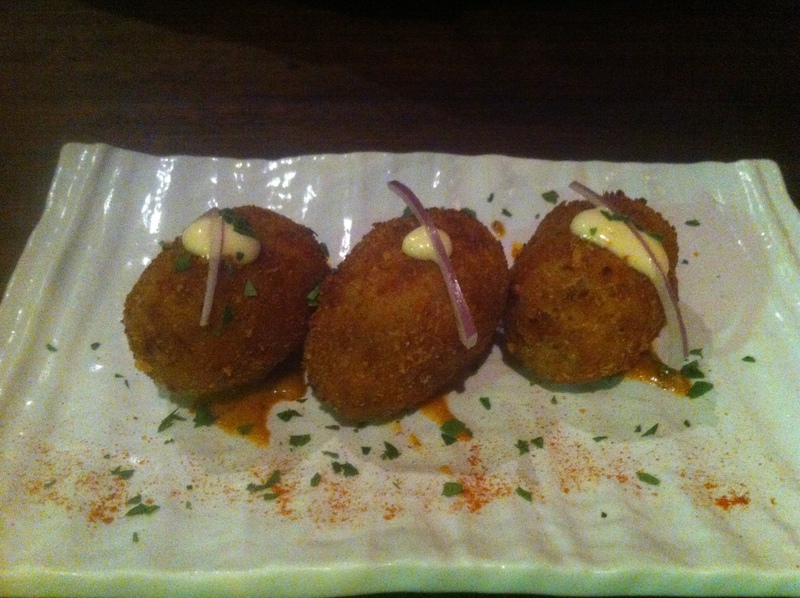 CODITOS de POLLO al ESTRAGON ($4 for two) – Crunchy spiced chicken drumettes with a tarragon vinaigrette. A.T and I were confused with this one, it wasn’t crunchy or spiced at all… It was bland but I thought the vinaigrette and the little dollop of guacamole saved the dish and gave it flavour. 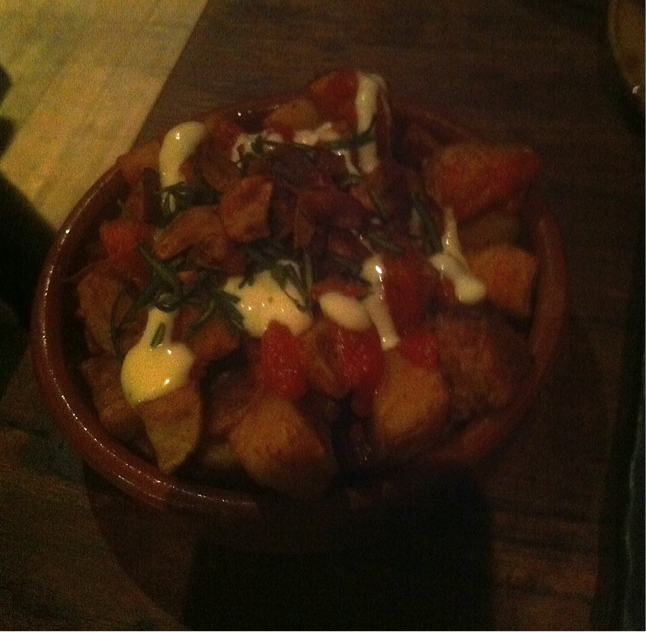 PATATAS BRAVAS ($4.75) – Deep fried potato cubes, topped with tomato salsa and garlic aioli. The cubes tasted like wedges, which were pretty nice with the garlic aioli and salsa but there wasn’t enough of the sauce!! I thought the rosemary was unnecessary, it’s only purpose was giving the dish a nice and strong aroma. It was hard to chew and left a weird texture and feeling in my mouth. QUESO de CABRA FRITO con MIEL ($4.50 for two) – lightly battered Spanish imported goat’s cheese on caramelised red wine, drizzled with orange caramel and sprinkled with almond sugar. I think eating this has made me learn that my tastebuds do not approve of goat’s cheese. It just tasted foul… like “someone farted in my mouth” (A.T). Very unpleasant and way too creamy for my liking. The only thing I liked was the thin crisp batter dipped in a bit of the orange caramel (the dish could’ve gone without the red wine). SURTIDO de POSTRES CASEROS ($7.50, for 2 persons to share) – tapas plate of Spanish desserts including churros (Spanish donuts dusted in cinnamon, served with chocolate dipping sauce), bunuelos de manzana (apple fritters), natillas granadinas (traditional Spanish custard) and ice-cream. There were many shortcomings with the dessert tonight. 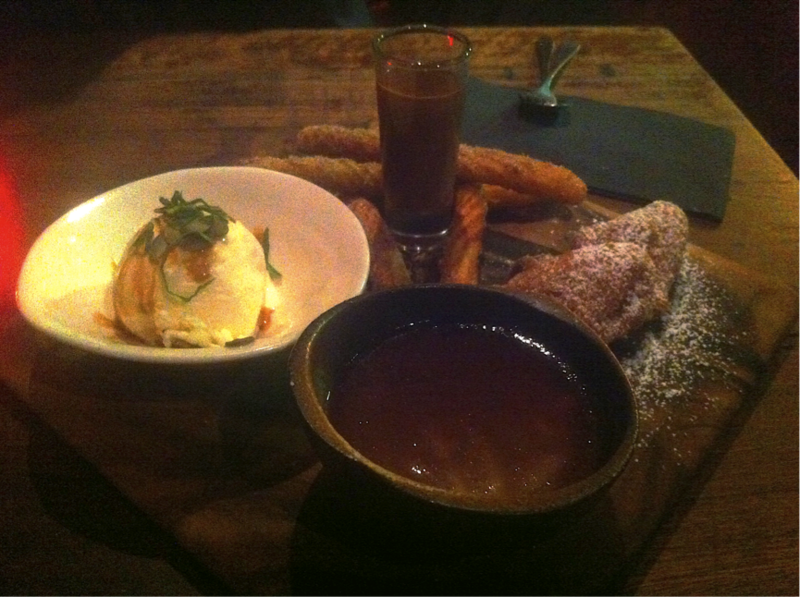 Let’s start with the churros: the donut was actually quite nice, great crunchy texture and the cinnamon made it sweet. The chocolate on the other hand, was very dark and bitter, which overpowered (‘overpower’ is an understatement) the sweetness of the churros. Apple fritters: more like ‘batter fritters’. In both of our fritters, there was only one small cube of the apple… so practically all we ate was dough. Spanish custard: I thought the flavours of this dish was flat and boring, there wasn’t anything that excited my tastebuds. 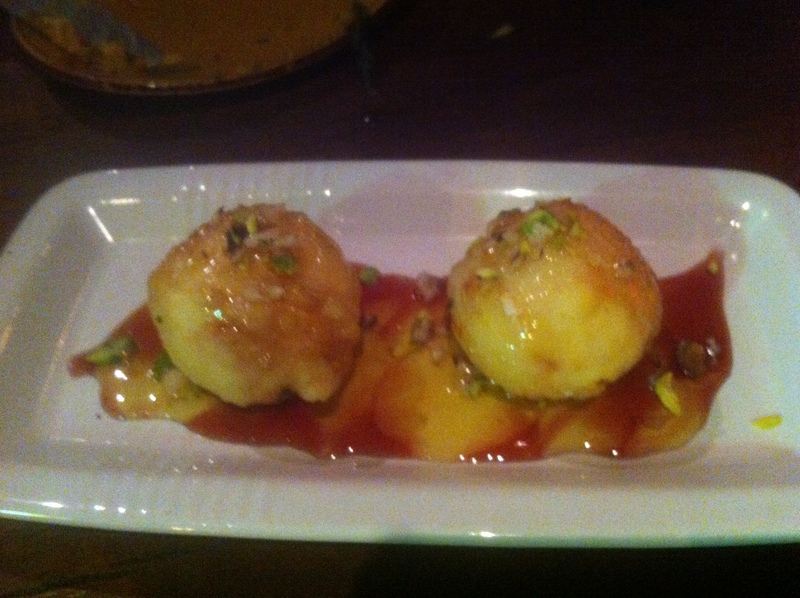 It’s one of those desserts where you dig in and your mind just goes “…” The texture was off as well, grainy and thick. Ice-cream: this was probably the best thing about the whole plate, and I’m guessing it was ice-cream from a local supermarket. I found it a bit weird that they put shallots on top though… it overthrows the idea of ice-cream being a dessert. Shallots should just stick to savoury meals. Overall, an average dining experience, some menu items were a hit while others were a major miss. I love the goat’s cheese here. My favourite dish. I actually ordered it twice because I loved it so much the first time. Although I can imagine you wouldn’t enjoy it if you don’t like the cheese. Yeah I figured it’d be great for people who like goats cheese. 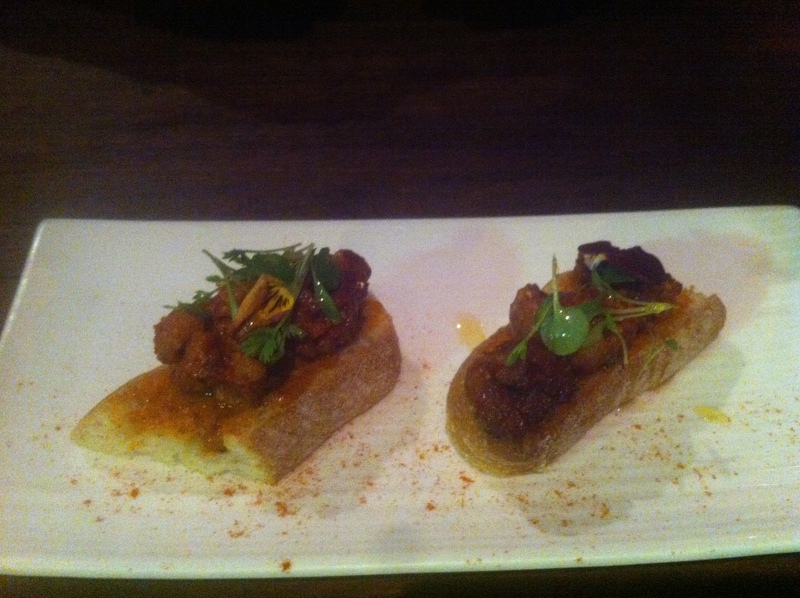 It’s a shame I didn’t because some of the other tapas were really lovely!